The Cloud Player is a music application built for anyone on the Internet to listen to music on-demand from the SoundCloud audio-distribution service. Using The Cloud Player you can search and play public tracks, save playlists and share them with friends. The application also allows the creation of smart playlists, which means you give it a few cues and it will retrieve all the tracks that match your query. To search and listen to music authorization is not required. To work with playlists a Google account is required. 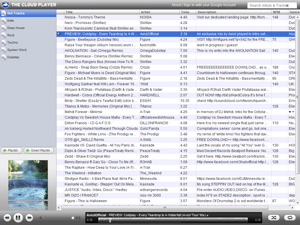 The interface looks almost like iTunes in your browser window.